Video conferences can help your business by saving you time and money. With video conferences, it is much easier and cost effective for your business to conduct interviews and meetings without having to travel. While some people today rely on Skype to save time and money, they sacrifice quality for convenience. Skype endure low-resolution cameras and microphones that appear unprofessional. Luckily, a middle ground exists where you don’t have to travel or settle for poor quality webcam alternatives. At Lake-Cook Reporting, we offer professional-grade video conferencing using high-speed internet, high-definition cameras, and professional microphones to deliver clear, crisp calls. 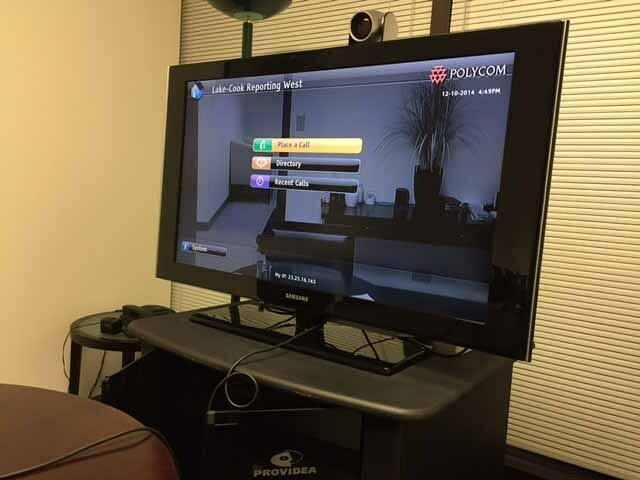 Our systems consist of professional units from Polycom and LifeSize, assuring both reliability and the highest level of detail available. Our technicians at Lake Cook Reporting test the connection for speed and quality as well as audio/video settings ahead of time. This will assure the highest quality video conference. Our technicians also monitor connection quality during your call so you can focus on your interview or deposition and make the best impression to your clients. Don’t spend your money on travel or misrepresent yourself over Skype. Choose video conferencing because first impressions matter. For more information about video conferencing, check out Lake-Cook Reporting’s page detailing its videoconferencing services.